A.k.a. Congress’s greatest friend of woo. 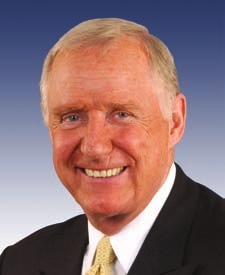 Danny Lee ”Dan” Burton was, until recently, the U.S. Representative (R) for Indiana's 5th congressional district, and previously the 6th district, serving from 1983 to 2013. Burton has been a staunch critic of what he terms the failure of government to determine the cause of the alleged current autism epidemic. In 2000 Burton chaired a congressional hearing on the link between vaccines and autism, implying that his grandson's autistic behavior was caused by receiving nine shots in one day and in general promoting Wakefield’s fraudulent research (there’s a nice analysis here), pressuring the NIH to launch a five-year, $30 million study of chelation therapy for cardiovascular disease. Burton has been ardently involved in antivaxx promotion and its associated battle against reality since then; he is an ally of Nicholas Gonzalez, and a staunch defender of NCCAM – indeed, Burton is so friendly to all things woo and denialism in medicine that he has managed to acquire a substantial folder at Quackwatch for himself. He was for instance behind the highly unethical TACT trial and legendary for bullying Richard Klausner, the former director of the National Cancer Institute, to eventually cave in to pressure generated by Burton’s insane opinions about medicine; similarly with Claude Lenfant, former director of the National Heart, Lung, and Blood Institute. In addition to his antivaxx promotion, Burton was also instrumental in promoting the Vince Foster conspiracy theory against Clinton, and responsible for launching an actual investigation. Then there is, of course, the usual problems with stuff ordinary people may call”corruption”, which takes on an extra dimension given Burton’s instigation of an investigation into possible Democratic Party campaign finance abuse; the committee, and Burton's leadership, were labeled a ”farce”, a ”travesty”, a ”parody”, and ”its own cartoon, a joke, and a deserved embarrassment” – and was also related to this and this. The entry would not be complete without mentioning his celebrated display of ignorance regarding geography (and history), sort of to complement his absolute ignorance of all things medical. Burton has also been awarded with an honorary degree from Robert Bradford’s unaccredited school of woo, which is not really an honor reasonable people would like to be bestowed upon them. Diagnosis: The combination of reconstructionist crazy and New Age woo is not particularly charming, but Burton has actually possessed the power to be able to cause harm in both areas. Though he might be, to an extent at least, neutralized by now, he must be considered sort of a legend in the annals of all things wrong and stupid.